Suitable for GAOMON Graphic Drawing Tablet S56K. NOT be compatible with Screen/Phone/PC/iPad/Wacom Tablet/Pen Display. (SUPER LIGHT) --- Only 14g. More comfortable to hold in the hand, makes your work smoother and easier, and your hand won't be tired after long time use. (HIGH PARAMETER) --- With 2048 high level pen pressure, make you use it like a real pen drawing on the paper, help you completing a great work. (INTELLIGENT DESIGN) --- Auto-sleep after 5~15 minutes of inactivity, saving energy and prolong the service life of Li-on battery. Only need to click working area of graphic tablet when you want to use the pen again. (RECHARGEABLE) --- Can be used continuously about 450 hours after charging 2 hours, more environmental and economical than battery pen. You can connect the pen with power bank/computer/wall adapter to charge it. Red LED indicator means it is charging, when the light went out indicates full charge. (PEN NIB & CLIP) --- Package Content: 1 x ArtPaint AP20 Pen, 1 x Rechargeable Wire, 4 x Pen Nibs, and 1 x Pen Clip. Pen tip can be replaced, prolong the service life of the pen and reduce the waste of resources. 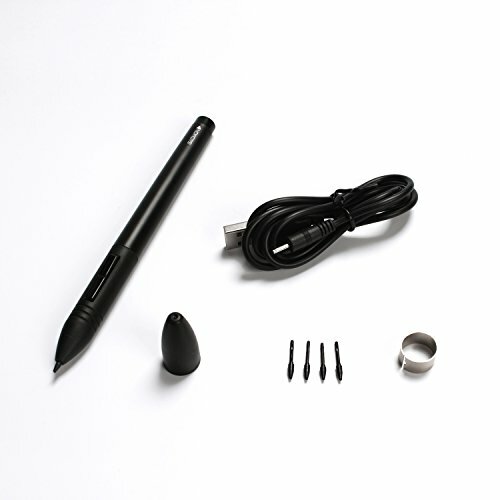 (PROGRAMMABLE BUTTON) --- There are 2 express keys on the pen which can be customized as you like.